In 'The Circle', What We Give Up When We Share Ourselves : All Tech Considered The film, based on the book by Dave Eggers, presents a dystopian view of where Silicon Valley is taking the world and captures the tech industry's failure to acknowledge the downside of its creations. 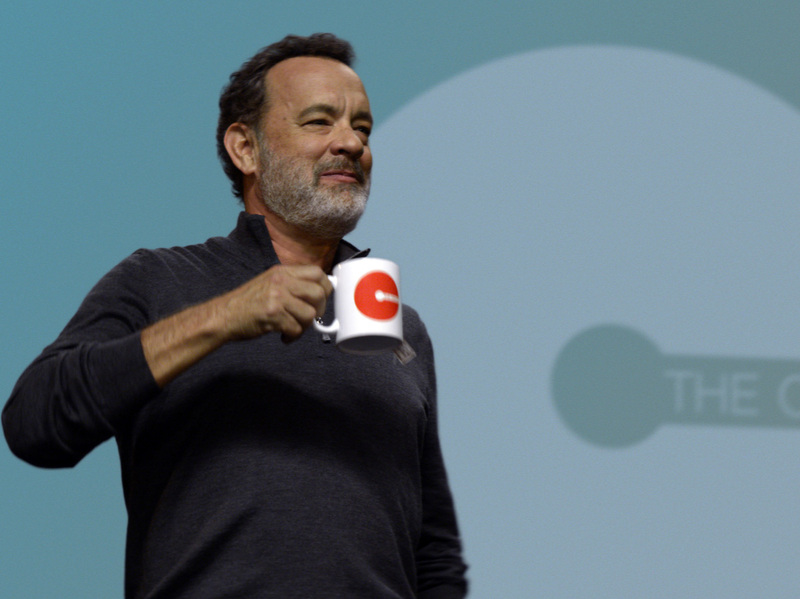 Tom Hanks stars in The Circle as a tech CEO who is part Steve Jobs and part Mark Zuckerberg. The Circle, the film based on the novel by Dave Eggers, presents a dystopian view of the direction Silicon Valley is taking the world. And, as a longtime Silicon Valley correspondent, I have to say there is a lot that this comic and spooky film gets right. Let's start with the main character, Mae, a recent college grad played by Emma Watson. Mae is eager, idealistic and versed in the kind of marketing verbiage that rolls off the tongues of way too many young people in Silicon Valley. When she goes for a job interview at the Circle — the world's biggest tech company — she impresses her interviewer with a comically perfect description of the company's main service. Sounding like a commercial voice-over, she says: "Before TrueYou, it was like you needed a different vehicle for every single one of your errands. And no one should have to own 87 different cars. It doesn't make sense. It's the chaos of the Web made elegant and simple." Mae rises up the corporate ladder quickly. She is taken with the company's charismatic CEO, Eamon Bailey, played by Tom Hanks. Hanks' physicality and manic focus bring to mind Steve Jobs; his zealous belief that his company will make the world better evokes Mark Zuckerberg. Bailey convinces Mae to take part in an experiment. She will be the first person to wear one of The Circle's small livestreaming consumer cameras all the time. "I'm going fully transparent," she announces at one of the frequent company meetings, where the staff applaud with cultlike enthusiasm. Mae's authenticity and good looks turn her into an Internet star. But life in the spotlight turns out to have its dark side. Her best friend is having a breakdown and they have to hide in the bathroom to talk privately with a time limit of 3 minutes. Mae tries to promote her friend Mercer's business — he makes chandeliers from deer antlers. Mercer, played by Ellar Coltrane, ends up the target of an online mob of animal rights activists. Meanwhile the Circle tightens it grip on the U.S. government — it takes down a senator who is investigating the Circle by leaking his personal information. It tries to take over the voting process so that all Americans must cast ballots using the Circle's technology. It all feels creepily plausible. The story nails Silicon Valley's failure to acknowledge the downside of its creations. For example, take Facebook's recent reluctance to admit it might play a role in spreading fake news. Dave Eggers, who wrote the novel the film is based on, says the idea for the book developed after years of living in the San Francisco Bay Area. "I've never met some villainous person that works at all of these companies," he says. But, "every so often you hear something come out of their mouths that you think 'that sounds really, really wrong ... really wrong.' "
For example, it sounds like a great idea to make searching the Web and photo sharing free. But it means collecting personal data and selling it. Eggers refers to "surveillance capitalism," a term coined by Harvard professor Shoshana Zuboff. "And with all of this has come an acceptance of a base level of surveillance that I would maintain that 30 years ago we would not have accepted," he says. The Circle's director, James Ponsoldt, a self-described technology addict, says he took on the project in part because he recognized himself in Mae's character. "Maybe not in her best aspects but in the worst parts of her personality," he says. "The parts of me that are probably too easily available, that will give things away too easily. By things I mean, a level of connection with people when sometimes it's OK to just not reply to your email that day." Visually the film does a good job of showing the manicured lawns and bright, clean campuses typical of Silicon Valley companies and their seductive self-containment: You never have to leave work — there's food, health care, sometimes even housing. There are even clubs and social activities and you can play volleyball at lunch. At the Circle, the pressure is on to spend every waking moment with colleagues. The film also captures the tech industry's consolidation trend. The company in the film has outsmarted all other tech companies or it's acquired them. And the idea of all that power in the hands of a single company makes Eggers worry about what will happen to our personal data. "You put it in the hands of a sinister, black-hearted person, then what would happen?" he says. Eggers says he wrote the book to see where his darkest fantasies would take him. He wants us to think about what we're giving away in the name of convenience. The film misses some of the salient details of the book that had me regularly nodding and laughing at how right Eggers had gotten it. It's not a perfect piece of cinema. But most technology isn't perfect either. In the audio of this report, as in a previous Web version, we mistakenly attribute the first use of the term "surveillance capitalism" to Dave Eggers. In fact, the term was coined by Harvard professor Shoshana Zuboff in an article published in 2015. Previously posted on April 29: A previous Web version of this story misidentified the name of the protagonist, using two different versions of her name. The character portrayed by Emma Watson is named Mae, not May.